Important things to know about camels in case you ever find yourself fleeing across the Arabian desert in an emergency. 1. They stand up back legs first – this means that if you’re not leaning back you’ll go pitching forward and off into the sand. Ask me how I know…go on… No, I didn’t actually topple off but it was touch and go. On getting seated I was much too close to the back of the saddle (which had a stiff back on it) and–with no stirrups of any kind for purchase, a fear of digging in with my ankles in case that was Bedouin for ‘run and don’t ever stop’, and with my rolling, dune-like arse–I really couldn’t lean back much at all. So when my trusty dromedary stood up (and it apparently delighted in taking its time) I manage to hold on for a little bit but then as it yawned and looked around a bit with its bum (and me) in the air and as my limited core-strength failed me, I started to tip forwards. Fortunately my squeals alerted the handler who chastised his camel into righting itself. I swear it bloody laughed. 2. They like to nuzzle – Camels are grumpy, bitey, clump-footed things but really quite lovely other than that. 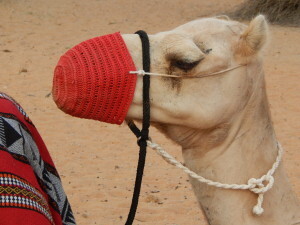 In the case of Al Maha’s camels, they are fully muzzled which I assumed was bite prevention strategy but which turned out to be more of a strategy to stop them rubbing their schnooz on the person immediately in front of them, because camels love to rub their faces on anything that can’t run away. Like, say, me. And, when tethtered, they often overlap a bit and you end up with the camel behind’s head just about resting on your shoulder. 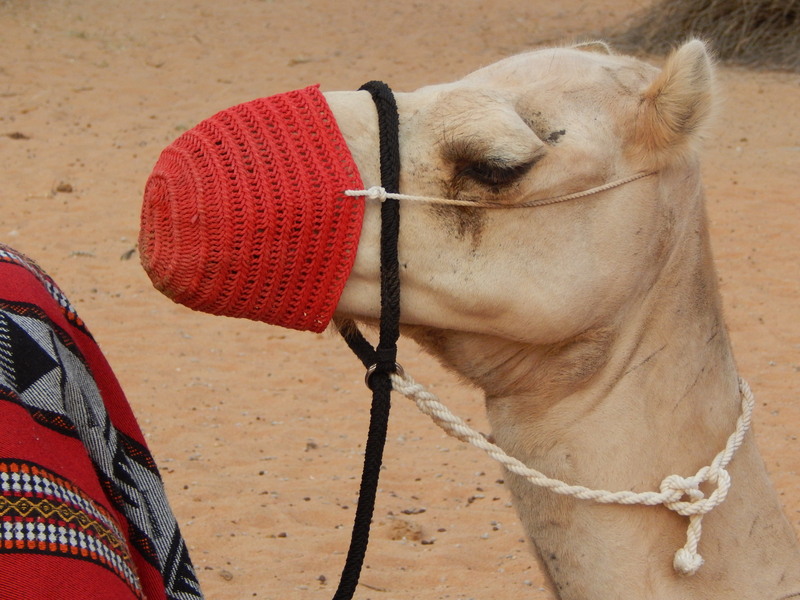 Personally, I love the malleability of camel lips but I do confess I wouldn’t really want it nibbling up the back of my neck while I hung on for dear life. And their breath and teeth are terrible. So the muzzle is as much about form as function. 3. Riding them is harder than you’d expect – you’d think getting up on a camel would be the biggest challenge in the whole ‘desert ride’ experience, closely followed (perhaps) by staying up. But no. There’s nothing keeping you up there except your anatomy and a small ‘handle’ in the saddle. This meant I adopted muscles that I haven’t used in an age to cling thighs-first to my ride, and I had to keep them clenched for 30mins as we walked out into the desert. About half way I felt brave enough to try and adjust my position and my hips protested like a 90 year old lady. The damage was done. For the rest of the ride all I could think about was how I was going to get off this beast with locked-up joint tendons and then what clever tactics I could employ to delay walking up the massive sand-dune that awaited until my joints were lubricated again. 5. Always have a backup plan Thank goodness that our desert walk happened to coincide with another couple’s desert drive and they joined us in their resort Landcruiser for sunset drinks. As soon as they came I hatched my plan. 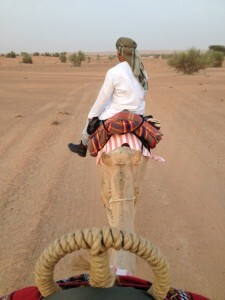 The thought of getting back on my trusty camel to do the whole hip-thing all over again…. Just no. 6. Camel survival techniques. A camel’s hump is made of fat, not a bladder of water, so don’t plan on spiking it like a keg if things get rough in the dunes. But the reason they’re so important to camel desert survival is NOT that they can metabolise water from the fat (though they can) but because the fat insulates the camel’s heart and other organs. So… next time someone comments on my weight I’ll just tell them I’m building up my insulation. 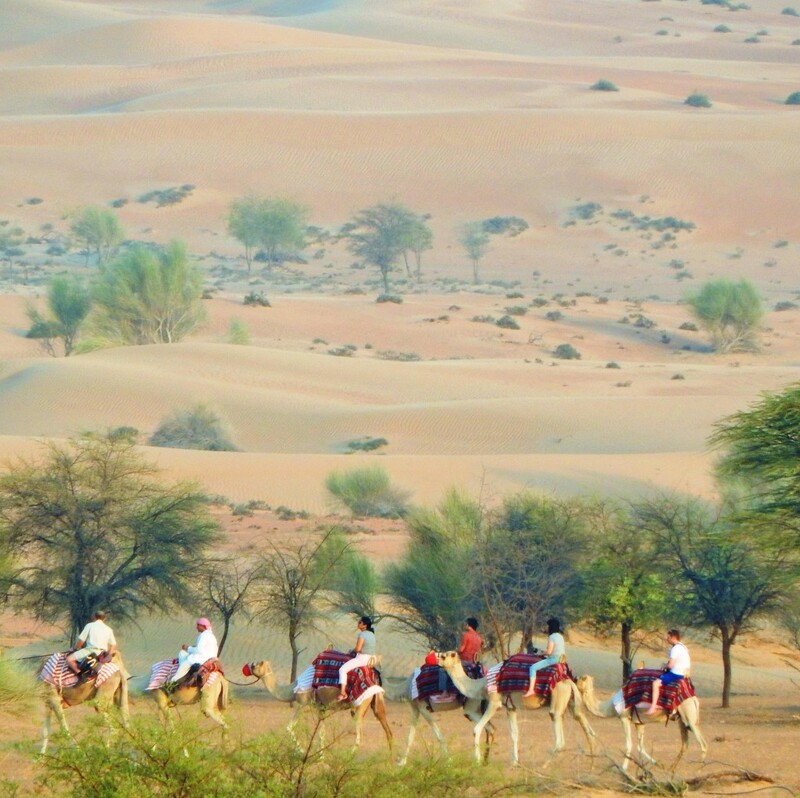 Other things that help the camel’s survival is their light colouring (and also why the Bedouin wear light colours), and their very calloused knees for kneeling on the hot sand. So the moment of truth came at the other end of the ride and—bless Al Maha—they had a step waiting there for people like me who couldn’t climb on without assistance. But there was no way in the world that I was going to be able to climb down via the steps with frozen hips and so I had no choice but to confess to my guide that I was going to need to take my time getting down. 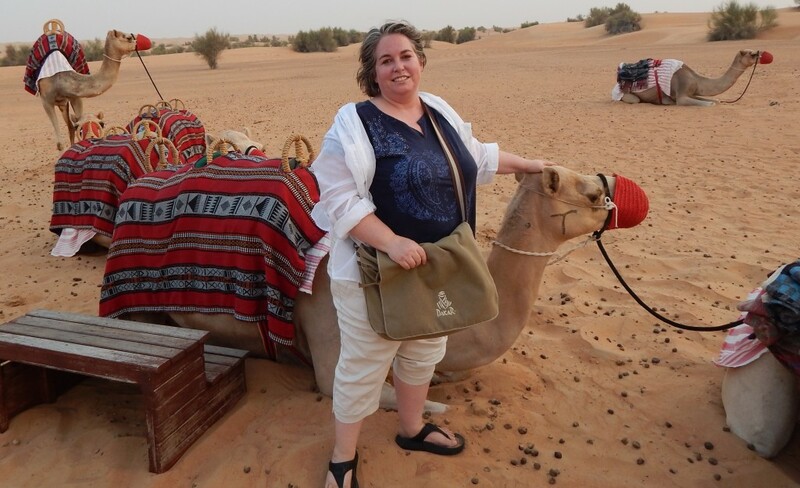 I held on more successfully this time as the camel reversed its standing up process, and then I sent everyone else off ahead up the sand dune and just sat and enjoyed the view from my kneeled camel while I flexed and unflexed various muscles like the nanna that I apparently am. Finally, when it was just me, the camels, the camel handler and the desert I attempted dismount. Imagine someone lashed together three sacks of potatoes and propped them up on a camel. Then imagine someone else gave them a shove. I waved away the handler who was wanting to help, leaned forward as far as I could (enough to swing my frozen leg over my camel, though I nearly kicked the camel behind as she stuck her nose in to watch the circus act) and then I just kind of…rolled off. Like a walrus plopping into the sea. One of the many good things about deserts is that they’re generally covered in soft, loose sand (plus the sand was covered in squishy, bouncy camel poo for extra cushioning) so hitting the ground wasn’t quite as injurious as you might imagine. The camels laughed. The camel handler laughed. And as I lay there whimpering, surrounded by poo and getting my hips re-located in their sockets, I laughed too. Kind of. But I knew what was yet to come. 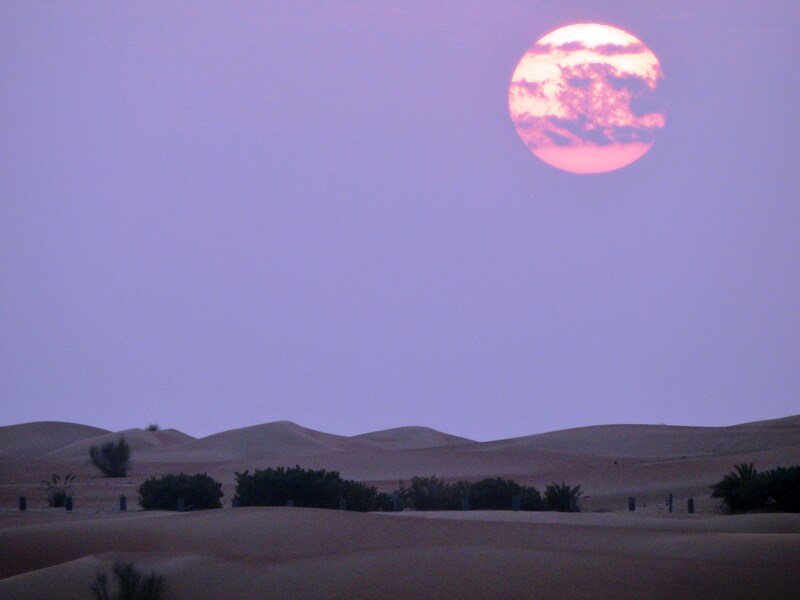 Me and my screaming hips had to walk up a tall, loose sand dune to watch the sunset with a drink in hand. I paused for a quick photo then set off up the dune. 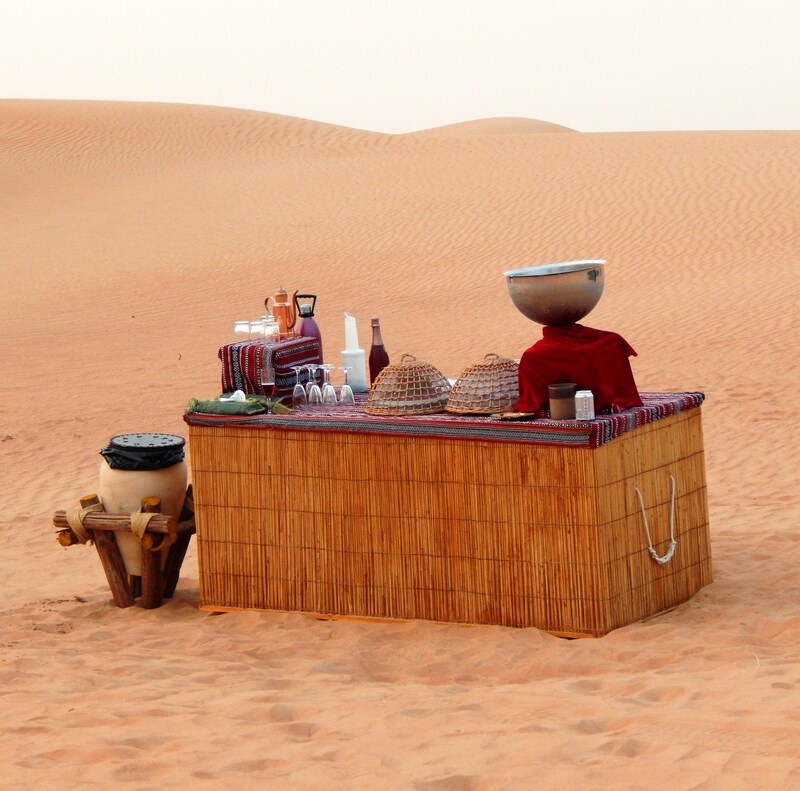 Lawrence of Arabia met me half way and offered me the drink. I waved him off with a less than cheery “angonijestnoodtugettothutop” as I chugged on past him like The Little Train that Could, until I got to the drinks station which was stationed, sadly, not at the top but half way. I never did see the top. The view was probably spectacular. I clung to the drinks station and its flat-sanded clearing and guzzled a bottle of water whole. There was a very nice local concoction of sparkling pomegranate which I vaguely remember pouring down my throat, too. And then I busied myself taking mid-way kinds of photos–of the camels, of the spinifex, of the patterns in the sand, the sunset. The drinks station. Anything to ensure I had plausible deniability re: scrambling to the top of that dune. And when it came time to go back to the resort, I’m sure I astonished no-one by asking to go back in the Landcruiser with the American couple who I chatted happily to all the way back. They were lovely and friendly and it was only at the end of my visit that I discovered that they were on the first day of their honeymoon and instead of having lovely, romantic-time on the way back they had a bruised, sweaty, Chatty Cathy with sand still falling out of her trousers. How’s that for quality honeymoon memories? But you know what? I wouldn’t have cared if they’d told me. At that point I was so hot and so exhausted and so sore I would have clung to the back of the Landcruiser rather than get back on Kevin the Camel. Not because I didn’t WANT to love Kevin or his kind, just because I couldn’t face the thought. All of that notwithstanding, I would definitely recommend the camel ride as a must-do thing. Just limber up first. Tomorrow…vipers and unicorns. Stay tuned. Aha! Now I understand how ‘nuzzling’ (a camel term) came about. Thanks for the helpful visual description.